Santa’s Hotel Tunturi, previously also known as Saariselka Tunturi Hotel, provides modern-style quality accommodation in Saariselka. About 100 meters from the main building with reception and three restaurants are six buildings of rooms and apartment suites. Hotel Tunturi has 96 standard hotel rooms, 77 superior hotel rooms, 6 junior suites, 1 Gielas suite and 53 apartment suites with one, two, three or five bedrooms and 10 Deluxe rooms ja 17 Kontio Suites. 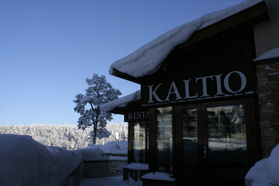 The three restaurants and Lappish Hut offer Lappish and Scandinavian delicacies. Hotel Tunturi has also modern conference facilities including big auditorium of the Congress Center with 200 seats.